With Opta releasing the summary activity for every player for every Premier League match last season, it gives the opportunity to analyse in some depth the relative performance of players/teams. The first area I've looked at is the performance of the top scoring player at each club last season, ranging from 30 goal Robin van Persie down to Franco Di Santo who was Wigan's top scorer with 7 goals. 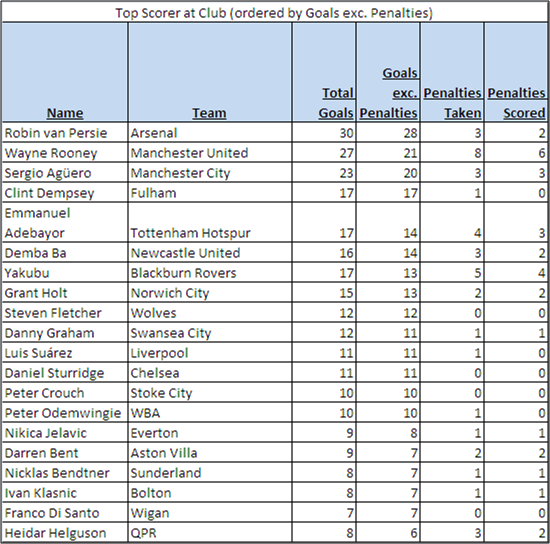 At first glance, in terms of goalscoring you would argue that van Persie and Rooney are in one category, Aguero in a second bracket on his own, followed by a group of five on 15-17 goals. 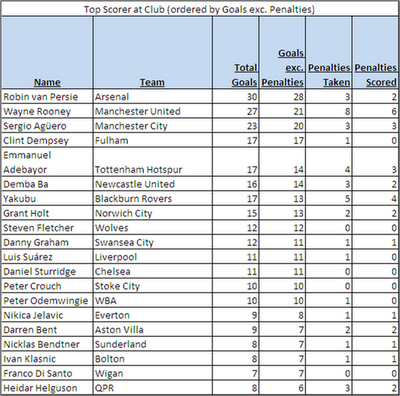 Here it can be seen that van Persie was a long way ahead of anyone else and that when excluding penalties Adebayor and Yakubu drop back in to the main pack. 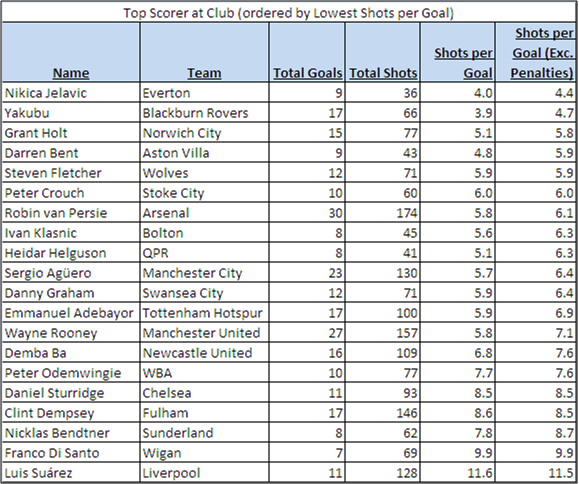 Ordering by number of shots taken for every goal scored (excluding penalties), Nikica Jelavic jumps to the top of the list after having a superb couple of months at Everton. Papiss Cisse had an even better return with one goal every 3 shots (13 from 39), but excluded from the above as not top scorer at the club. Much has been made of Suarez's finishing ability and in terms of shots per goal, his figures are the worst of those above. 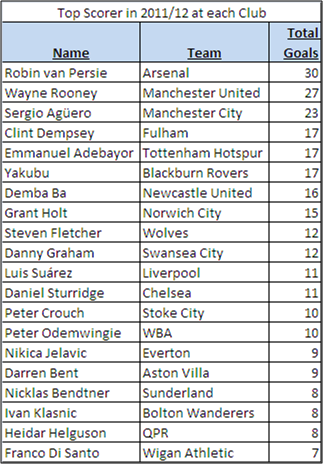 Also interesting to see that even excluding penalties, Yakubu still has one of the best shots per goal figures. One thing both Yakubu and Jelavic have in common is that watching them score you get the feeling they are 'lucky' players often scoring relatively simple goals. In reality the skill is in making it look easy and being in the right place at the right time. I would also expect that a penalty is classed as a 'big chance' so could possibly get removed from the above to make comparisons fairer. 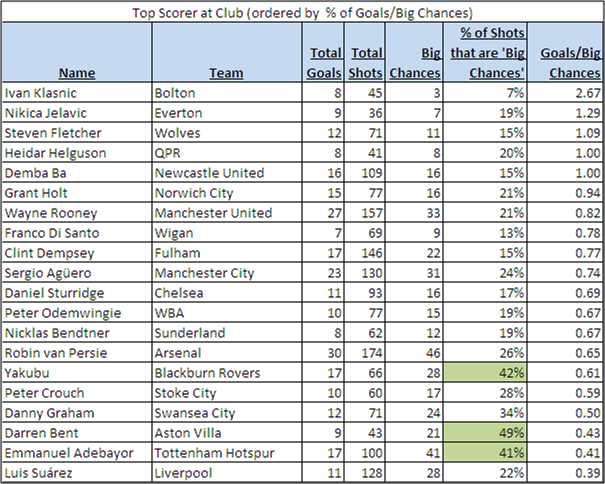 It's interesting to see Klasnic of Bolton at the top despite having relative few big chances. After an excellent start to the season scoring in each of the first 3 games, missed a couple of games due to suspension and for whatever reason doesn't appeared to have been called on much towards the end of the season. Klasnic played in all of the last 11 league games for Bolton but didn't play the full 90 minutes in any and only 300 minutes in total during those 11 games. For the three players highlighted in the figures above, over 40% of their shots were classed as big chances (this is a simplification as some big chances may not result in a shot e.g., player delays too long and defender comes back to tackle). Almost half of Darren Bent's shots are big chances, Bent along with Danny Graham at Swansea have the lowest number of touches per game with 28 (compared to Fletcher with 42, Suarez with 61 and Rooney with 70), for Graham for example large parts of the game are closing down defences and making runs to create space for others rather than necessarily receiving the ball. This places much bigger pressure on the chances when they do come and also the lack of shots means it's quite easy to go a few games without scoring through little fault of your own. Obviously there are numerous other parts to what make up a good striker (which I'll be aiming to look at in later posts). Aside from the likes of van Persie, Rooney and Aguero who can create things for themselves and are far more than just front men, for most teams the main forward is there to take the big chances and Steven Fletcher's stats above combined with 3 goals in 2 games this season show the value in someone who is a proven finisher.